As in so many other aspects of Croatian life, business hours vary a great deal between the diligent interior of Croatia, including Zagreb, and the more relaxed coast. And in the summer, there is even more of a difference in working hours as the tourist offices along the coast fling open their doors to welcome the visitors that keep coming and coming. Left to their own devices, Croatians are early risers. The morning rush hour starts as early as 6.30am as many businesses work from 7am to 3pm or 8am to 4pm Monday to Friday. That's why you'll often see restaurants nearly empty at noon and then packed from about 3pm. People in back offices (not stores or services) like these hours. 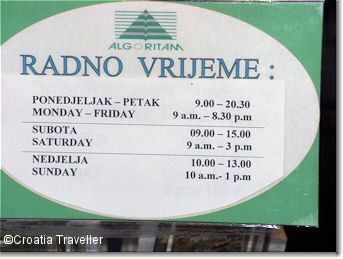 Stores in Croatia are open long hours, usually from 8am to 7pm on weekdays and until 2pm on Saturday. Sunday shopping is only allowed during the tourist season. See more on shopping hours. Restaurants are usually open from noon to midnight but many close on Sunday. Tourist offices have standard business hours during the off-season but the hours steadily lengthen until they work nearly a morning to midnight schedule at the height of the summer. Banks are usually open from 8am to 4pm. Post offices are closed on Sunday and Saturday afternoon but are open long hours on weekdays: usually from 7.30am to 7pm.